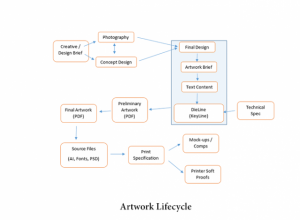 Throughout the lifecycle of an Artwork there are various documents and files that are generated. Each of these have a need for specific stakeholders in the process. We will go through some of these document types and explain when and where they are used. The Design Brief is a statement of what you are going to make, why you are going to make it, and for whom you are making it for. It should be an open ended statement. Marketing teams are notorious in giving partial, incomplete and sometimes no brief at all. A phone call or a text message comes across to the agency, and the agency is trying to read the client’s mind and they go off and start executing. Good briefs are usually don’t contain bullet points but tell a story that inspires. Design specifications and constraints if any are also included in a brief. Whether a shot to capture a moment, or a set of images to sell your product, photographs are most often used in the creative design phase. These photographs are usually paid for and owned by the Brand and can be used anytime in the future. They eventually end up in a Digital Asset Library within the company for quick search and retrieval. Concept design can range from the entirety of a packaging design or product to something like graphic work for an already established template or brand. All of the graphic work involved with packaging design – Logos, layout, illustration, typography, and more – go into making the first set of concepts. As with any design project, clients will be sent concepts, mock-ups, and assorted design work during the process on the project. The Concept Design goes through various iterations and in each iteration changes are incorporated to layout, illustration, typography, colors, etc. The final green signal is given by the Marketing team and the designer or agency delivers the Final Design in high resolution formats. Packaging Artworks Briefs starts with defining the product. How many SKUs, how many components, how do the components correlate, what is the material or substrate that is going to be used, what is the printing process, what icons and logos to use, etc. This is the text that goes on the artwork. Multiple departments contribute this content and the text is approved before sending it to the designer. If it’s a food packaging, then the text includes the Nutrition Panel content, Ingredients, Warnings (Allergens, etc. ), Marketing Claims, Cooking instructions, Storage information, Barcodes, etc. This text content is usually given as a Word document to the designer. This is the specification document to create the Dieline. It includes the component shape and dimensions, Material of construction, Product considerations, Customer usability and Print requirements. It may also include the Drop Test & Ship Test requirements, Quality requirements and Performance specifications. A Dieline serves as a package template that ensures proper layout for a printed product. It is a diagram that shows all the cut lines and folds of a package in flattened form. Based on the Technical Specification, the dielines are created using Adobe Illustrator or a specialized tool. The Packaging Development team is usually responsible for the Dieline. Since folding cartons, rigid boxes, and corrugated boxes require different equipment to manufacture each of them, it’s important to know which suppliers produce what kinds of boxes and involve them during the Dieline design process. The dieline is shared as a PDF format or as a DXF format. The Artwork is the place where the Creative Design, Text Content and the Dieline come together to meet the specifications. The placement of the design elements, the color and font attributes of the text are key aspects of the Packaging Artwork. Even though the artwork is created in Adobe Illustrator, a PDF file is typically shared for approval and then the AI file at the end of the process. Artwork text could also be in multi-lingual formats and needs to be supported. The preliminary artwork goes through an approval process where issues are identified and reported back to the designer. Once corrected a second version of the artwork is uploaded. Changes could happen in any of the design elements of the product. The print specification is the spec for preparing a file to print. It contains information on image resolution to be used, Crop Box and Bleed box requirements, Safe areas, Spot colors and transparency used. Information on substrate material and print process to be used are also specified. Based on the print specification, the printer will prepare the artwork to the printed. The final copy of the artwork before printing (called a Soft Proof) is shared with the client for confirmation. Once confirmed the printer will start the print run. The client usually compares the print proof with the approved digital copy to make sure everything is correct. Mock-ups are used to get a feel for the final product packaging before a production print. Its also used for sales samples and as props in advertising. Creating Mock-ups early in the cycle allows Marketing to make any modifications to the design before its too late. Printers do a low volume run to create these mock-ups and Comps. With the advent of 3D and Augmented Reality technologies, the need for physical mock-ups is reducing.